Coffee-mate Original liquid creamer is a rich and delicious creamy nondairy creamer that delivers a consistently perfect cup. 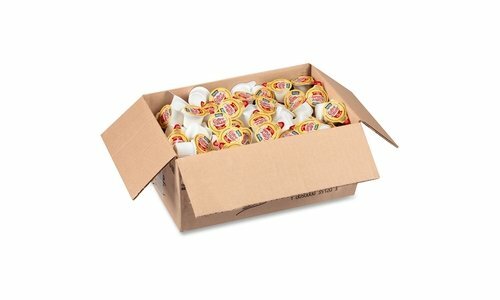 The single-serve cups are great for your breakroom or reception area. With this popular creamer in the office, everyone can enjoy coffeehouse indulgence without ever leaving the building. No refrigeration is necessary. Creamer is Kosher Dairy, lactose-free and gluten-free. View More In Non-Dairy Coffee Creamers. If you have any questions about this product by Coffee-mate, contact us by completing and submitting the form below. If you are looking for a specif part number, please include it with your message. Coffee Mate Peppermint Mocha Liquid Coffee Creamer, 18.7 Fluid Ounce - 4 per case.